(LONGMONT, CO) – Left Hand Brewing Co., one of the original pioneers in craft brewing, is celebrating 25 years of righteous independence on Friday, Sept. 21, 2018. From a humble homebrew kit beginning to becoming one of the top 50 craft breweries in the U.S. led by its flagship Milk Stout Nitro, Left Hand has continued to grow and innovate throughout its 25-year history. 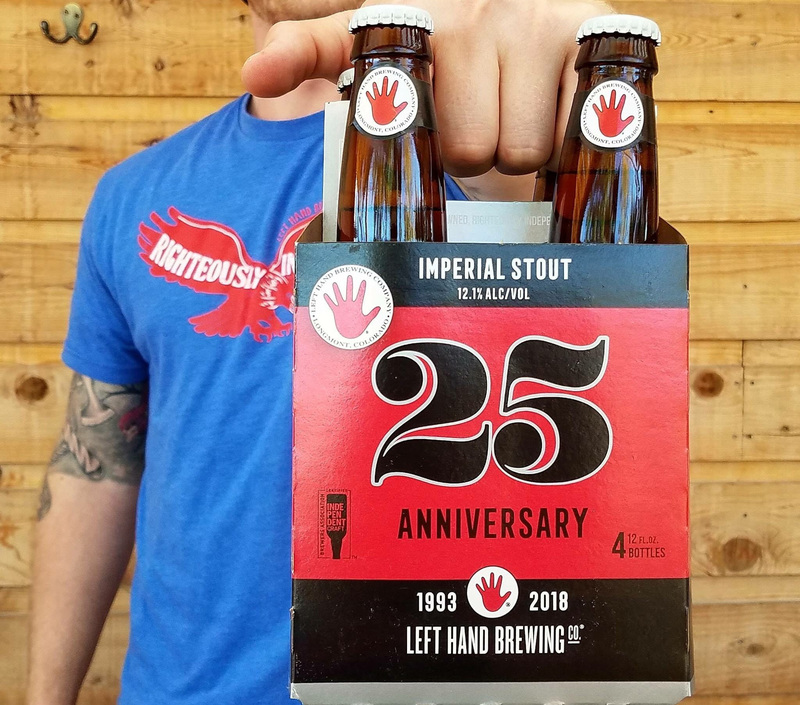 On Friday, Sept. 21 from 9-11am at its Longmont Tasting Room (1265 Boston Ave.), Left Hand will be releasing its 25th Anniversary Imperial Stout and celebrating 25 years of beer. At 12.1% ABV, it features assertive notes of dark chocolate, cherries and roasted coffee beans with a smooth warming finish. It will be available in 4-pack, 12oz bottles for $13.99 and a limited quantity will be available for purchase before you can buy it anywhere. Attendees are encouraged to get in line early for a ticket to purchase their 4-pack, which can be enjoyed fresh or cellared for continued aging. In addition, Yolk ‘n Around food truck and Allegro Coffee will be on the scene along with music by Scott Von. Left Hand’s Co-Founder and President Eric Wallace also will be giving a toast to attendees and employee owners at 10am. Left Hand will be pouring its 25th Anniversary Imperial Stout at the Great American Beer Fest (GABF) Sept. 20-22 in Denver in addition to its award-winning line up including Milk Stout Nitro, Fade to Black Export Stout, Sawtooth Ale and others. Employee Owned, Righteously Independent. Celebrating 25 years of brewing a well-balanced portfolio of craft beers, Left Hand Brewing Company is located at 1265 Boston Avenue in Longmont, Colorado. Left Hand is one of the most honored and recognized breweries in Colorado, with over 28 Great American Beer Festival medals, 11 World Beer Cup awards, and 9 European Beer Star awards. Famous for our Nitro series, Left Hand launched America’s original Nitro bottle with our flagship Milk Stout Nitro and the first production run of U.S. made Nitro widget cans. Left Hand’s collection of perennial and seasonal beers are available in 41 states, DC and internationally. For more please visit www.lefthandbrewing.com.